The Peter Tosh Estate would like to express how thankful we are to each and everyone who participated and are responsible for the 2017 Peter Tosh Music Festival being such a success. From the VIP Peter Tosh Gala, the very first Peter Tosh Awards, the Equal Rights and Justice Symposium, the Peter Tosh Tribute Concert and those who joined us on the Reggaemilitis excursion to Belmont, Westmoreland; all of these events would not have been the same without you all. A huge thank you to our sponsors, musicians, performers, media/press, speakers, recipients, attendees/fans, and every single person who were a part of the 2017 Peter Tosh Music Festival, presented by the Peter Tosh Museum. 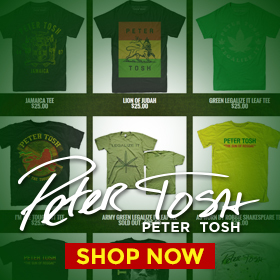 We appreciate you and your continued love and support of the legacy of Peter Tosh. We look forward to seeing you all next year, October 18th – 21st, 2018.